Her mother Karlina was an orphan, who came to Riga to work for well to do German families as a housekeeper and general helper. Karlina learned the refined habits and customs of the upper class, learned German, and came to appreciate music and ballet. Karlina passed on these values to her daughter Anna. Anna’s father Karlis also spoke German, so Anna learned to speak German, Russian, English, and of course Latvian, languages that would serve her well. She went to Vilis Olavs Commercial School in Riga. Part-time and eventually full-time, she worked at the office of the Latvian Ballet, where she first met her future husband Leonids Breikss at the age of 16. On their first meeting Leonids gave Anna Bildere his book “My Dream Land” with an inscription. She remembered him as being handsome, outgoing, and quite famous. She was very young, and very pretty, and Leonids kept his eye on her whenever he visited the Ballet offices. Anna was aware of this, and a dating relationship started when she got close to a “marriageable age”. They were a striking couple, she dressed in the latest European fashions, he impeccably dapper in his three piece suit with a hankerchief in his breast pocket. They went to parties, social events, even went cross country skiing. They married on May 25, 1940, in St. John’s Church in downtown “Old Riga”, when she was 21. But on June 17,1940 the tank units of Soviet Russian Army invaded Riga, and everything changed. The free country of Latvia ceased to exist. The Bolsheviks sought to remove all opposition to communism, and ruthlessly captured and imprisoned many intellectuals, politicians, public officials, and members of the military, and exiled them to work camps in Siberia. Leonids Breikss, Anna’s husband, was apprehended the night of April 17, 1941. That was the last time Anna saw her husband, who never saw his son Peter Breikss, who was born November 24, 1941. There was a warrant for Anna’s arrest, and Anna had to hide at her parent’s cottage at “Jurmala”, the beach area some 30 miles from Riga. The Russians were driven out of Latvia by the Germans, and a relative peace returned to Latvia, until the summer of 1944, when the Germans were forced out by a return of the Russians. Anna’s father Karlis was concerned for Anna, and bought the necessary tickets to take Anna and her little son Peter to Vienna, via Stettin Poland by boat, then by train through Germany to Vienna, Austria. Anna still did not know of the status of her husband Leonids – was he still alive? In Vienna, Anna met other young Latvian women who had escaped the Russians, and they comforted each other and shared information. The war ended, and people started to relax. There was news of an opportunity for work, and therefore money for food, in Bavaria Germany, in a town called Grafenau. And that is where Anna took Peter, in the summer of 1945. She was now 26, and Peter 3 ½ years old. Anna’s first job in Grafenau was at a jam factory, where she and her friends filled little jars and large pails with jam. She rented a room in a house for herself and Peter, and hired a German nanny to look after Peter while she worked. Not long later, Anna learned that there was an American military base in Grafenau, and that they were looking for interpreters. Because she spoke English, German and Russian, she got a job there. This was a huge step up, both in income and in the availability of food. Now she could get bread, butter, eggs, and even canned peaches – a delicacy nicknamed “naked mice”. Through the American network, she asked the Red Cross if there was any information about her husband Leonids, and the answer was “no”. Peter entered kindergarten at the age of 5, and learned to speak German and the Bavarian dialect used by the children in the street. Anna had her circle of young lady friends, and also met a young Polish/German man named Hans Pazulla, whose refugee parents and 3 sisters also lived in Grafenau. And she met Maria Blach, who had a son “Hajo” one year younger than Peter. And there were Latvian friends nearby in Regensburg, Friddy and Roberts Jansons and their son “Romits”. Anna and Hans became good friends, and Hans’ mother looked after Peter when needed. In early 1948, the United States and Canada started to accept post-war immigration applications. Anna had excellent contacts with the military authorities, and her friends offered to help her find a job “in America”. Hans could not qualify, as he lived in Germany, and Germans were not welcome. Anna told Hans that he could follow her to America if wanted to see her. The Dr. McCue family in Smith Falls Ontario needed a housekeeper, and Anna and Peter travelled by train to Genoa, Italy where they and hundreds of other immigrants boarded the passenger ship “Nea Helas” to go to Halifax, Nova Scotia, Canada. Peter’s 7th birthday was in the mid-Atlantic in stormy seas, and they landed in Halifax in late November. Ajax Ontario was the next stop, when Anna and Peter were quarantined to make sure they were healthy, then to Smith Falls, their “new home” in Canada. Anna and Peter lived in a genuine “garret” – a small room on the 3rd floor of the McCue house, under the roof. Anna was the housekeeper, working under the direction of Mrs. McCue, to look after her son Wilson and daughter Susan, as well as the parents. Anna did the laundry, cleaned house, and other housekeeping chores. Anna corresponded with Hans in Grafenau, and when Dr. McCue made advances to Anna, she asked Hans to come to Canada, with a promise of marriage. Hans applied for immigration to Canada as a Polish person, as his home in Silesia, formerly part of Germany, after the war was part of Poland. His application was approved, and Hans came to Smith Falls in the Spring of 1949. Hans worked as a labourer for $0.75 per hour, on the foundation of the Smith Falls Mental Institution. 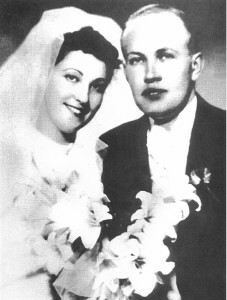 Anna and Hans Pazulla were married in August, 1949, the three of them went on the honeymoon to Niagara Falls. They couldn’t live in the McCue household, so Hans and Anna had to look for new jobs and a new home. The German newspaper “Der Nordwesten” in Winnipeg needed an editor, and Hans applied, because he was also “part” German. No one seemed to care that he only had a grade 8 education, because Hans was exceptionally bright.He was a superb typist, a wireless operator during the war, and very proficient in the “high german” language needed in the German newspaper. He was, as we say today, “a quick study”. He ended up being the editor for over 8 years. In his spare time, he founded the Winnipeg Canadian-German Soccer team, which played against local Winnipeg English and Scottish soccer teams. Adjusting to life in Winnipeg took time – the first house in St. Boniface was too expensive. Temporarily, they moved to a rented room on Magnus Street in North Winnipeg, but they had little furniture. They made do with wooden apple boxes covered with colorful cloths as end tables. Next, they briefly stayed in a boarding house on Stradbrooke Street, where the metered gas stove in the kitchen required coins to be fed in when the stove was needed. Then finally, Hans and Anna rented their own large 3 story house on Chestnut Street, and opened their own boarding house. Anna, Hans and Peter lived on the first floor, with Anna and Hans’ bedroom in the converted dining room, and Peter’s bedroom the den. On the second floor there were single male boarders in single rooms, and the 3 member Wessel family rented the back 2 bedrooms and sunroom. Ilga and Joe Pommersbach rented the top floor garret. It was a busy household, organized by Anna. Ice in the summer was delivered by “the iceman” with a horse and wagon. Peter’s turn in the bathtub was Thursdays at 8:00 PM. That was home from 1950 to 1955. Anna and Hans’ first child, Peter’s brother Wolfgang, was born November 1, 1953. Hans was very entrepreneurial, and considered various business opportunities. He was offered the Volkswagen dealership for Western Canada, but when his family (Anna and Peter) saw the tiny, odd-shaped car, they told him Canadians would not buy it, so he declined the opportunity. Next, he opened “Continental Travel”, a travel agency, in Winnipeg, while still the editor of the newspaper. Anna was the first employee, and she learned ticketing with Trans Canada Airlines in Montreal. That summer, while Anna worked at Continental Travel, Peter was Wolfi’s babysitter. Wolfi visited the residents in the “house”, and he named Ilga, in his words, “Gagi”, a name she kept until she passed away in 2013. In Winnipeg in the mid fifties, there were about 15 Latvian families, including the Kamars and the Peles, who attended the Lutheran Latvian Church on Maryland Street, and whose children went to the Latvian School at 3 PM on Saturdays. So Anna lived her days in the German language at home, but did not forget her and Peter’s Latvian heritage. In 1954, Hans came home and announced that he had bought a new house, and that the family would move from Chestnut Street to “Kingston Crescent” in St. Vital, a very upscale part of Winnipeg. Anna asked Hans if the family could afford it – she was worried. But the Pazulla family moved, and it was a huge step upward and forward socially. The house was the smallest in the neighbourhood, but no one was prouder than Anna and Hans. They had made it!! Anna decorated the new house, and the living room was in “modern” colours, a grey carpet, light yellow walls, and an original oil portrait of Anna over the grey tweed chesterfield. They held several parties every year, where anna’s “Rossol” potato salad was a runaway favourite. Several of Hans’ business associates said that Anna was the main reason that Hans was successful. Everyone loved Anna. And then, on August 20, 1954, Hans and Anna had their second child, their daughter Ilse, who was the family’s centre of attention. Now Anna was busy – two young children, and an active husband. They had numerous parties, lots of friends, and they were the center of the German-Canadian community in Winnipeg. In the fall of 1958, Hans changed jobs, because the owner of National Publishers, who also owned “Der Nordwesten”, Charlie Dojack, refused to give Hans a raise. So Hans found a new job in Toronto, Ontario, as the Canadian Sales Manager of North German Lloyd, the newly re-established German Steamship line founded in 1857, and now, after the war, with 3 ships that needed to be marketed. The North American Head Office was in New York, and the move to Toronto was a new move upward again for Anna. After renting an apartment on Stevens Drive on the west banks of the Humber River for 6 months, Hans and Anna bought a new house at 56 Brampton Road, in the Kipling and Westway Road area of Etobicoke. The timing of this move worked for Peter, who started Chemical Engineering at the University of Toronto. And living in Toronto was wonderful for Anna, because Toronto had the largest Latvian community in the world, outside Latvia. Gagi and Joe Pommersbach moved to Toronto, from Winnipeg, as did the Kamars family, including Agra, now Agra Spittel. Anna started going to the Latvian Center on Eglington East, which became the cultural and social hub for Latvians in Toronto. Anna was one of the founding contributors, but not part of the ongoing operation. Wolfgang and Ilse grew up on Brampton Road, going to the Catholic School at the Church of the Transfiguration not far from their house. And then Wolfgang went to Kipling Collegiate, which was very close, where he played on the football team, and then in Grade 13, became the President of the student body. Ilse had a good group of friends as well. Clearly, the next generation of the Pazulla family had become successful Canadians. And Hans found a new and better house on Warrender Avenue, in the Princess Margaret area of North Kingsway. This again was an upscale community, another step forward and up for Hans and Anna. After 10 years with :NGL”, Hans started to worry about the future of the steamship business. Travel across the Atlantic was no longer by ship – it was now by airplane. The cruising business did not seem solid, and Hans decided to get out before it was too late. So Hans looked for a new career, and it was with the Ontario Government, in the promotion of industry and tourism in Austria and some eastern European countries. Hans represented Ontario in Austria and mainly Poland. Hans was ideally suited – he spoke English, German, and Polish. At this time, he adopted the name “John”, in his belief that the name “Hans” sounded too German, and “John” was more English, which was what was needed because he represented a Canadian Provincial Government Ministry. The move to Vienna was again a major geographic and cultural change for Anna – she was torn out of her comfort zone in Toronto, and dropped into Vienna, Austria. But, Anna loved Vienna, the Opera, the German language, the friendly Austrian people, her familiar old world. Ilse had not finished high school in Canada, and so she moved to Europe, to finish her studies in Grenoble and Heidelberg. Ilse succeeded in obtaining a good position with the Canadian government in Frankfurt, not too far from her future husband Werner, who lived in Cologne. Anna’s family was fine, and growing. Peter had married Myrna Card, and they had moved to Vancouver, BC., with their 2 year old daughter Karlina, named after Anna’s mother. Wolfi was a successful lawyer in Toronto, and he married Donna Groen, his highschool sweetheart, and they had their first child, son Andrew. Ilse married Werner Gschweng in Frankfurt, Germany where she worked for Air Canada. She was proud of her successful children. And more grandchildren came along – in Wolfi’s family, Stefan and Heidi were born, and Christopher Leonids Breikss was born in Vancouver to Myrna and Peter. The Vienna posting was followed 6 years later by a move to Frankfurt, still for the Ontario government. Anna had to move again, find a place to live, redecorate again. She was getting tired of moving every 5 years, and said so! Nevertheless, 5 years later they moved back to Canada, and Hans was assigned to Owen Sound, in Ontario, two hours north of Toronto, by car. They bought a farm in Mount Forest, which was their “cottage” and weekend retreat. They had two horses, one of which was called “Candy”. The children and grandchildren loved to visit the farm, and Anna , now called “Oma”, and Hans, called “Opa” in the German tradition. Hans retired from the Ontario Government, and Anna and he moved to the house Wolfi had bought for them as an investment, on Alhart Drive, in north Etobicoke. Anna said this was her last move, and she was never moving again, and she was right. When Peter was about 4 years old, and had misbehaved, Anna told Peter that God was watching him, and could see what he was doing, so he should behave. Peter asked where God lived, and Anna said “God lives in heaven”. So Peter said “OK Mom – you and I should go and visit God in heaven”. And now, that is where Anna is – in heaven. What a beautifully told story of remarkable Anna and your family. I read it twice, and not once without goosebumps. Good luck today with the passing of your mother. Can’t be easy but sounds like she was an incredible woman to be very proud of. What a wonderful life. A true romantic adventure. We’ve had a lot of water under the bridge since meeting on the hillside beside Humber Valley Tennis Club in the summer of 1960. Sorry for your loss,but this truly was a life to celebrate. 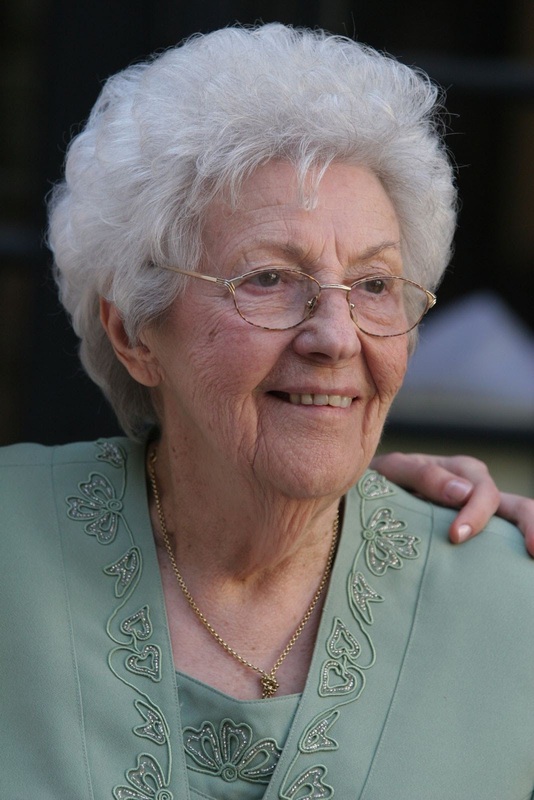 What an incredible life was led by your Oma! We are thinking of you and your family at this time. What a wonderful tribute. I couldn’t help but shed a tear. My condolences to you and your family. A woman whose strengths were surely passed on. Thank you for sharing her with us.